3D-PRINTING: HOW DOES IT WORK ? THE RAW MATERIAL (PLA, A BIO-PLASTIC) IS A SPOOL OF WIRE (FILAMENT), WHICH IS AVAILABLE IN MANY DIFFERENT COLOURS. THE MATERIAL FEEDER PUSHES THE FILAMENT THROUGH A TUBE AND INTO THE PRINT HEAD. THE PLA IS HEATED IN THE HOT END. A SMALL AMOUNT OF MOLTEN PLA IS PUSHED THROUGH A TINY HOLE IN THE TIP OF THE HOT END. 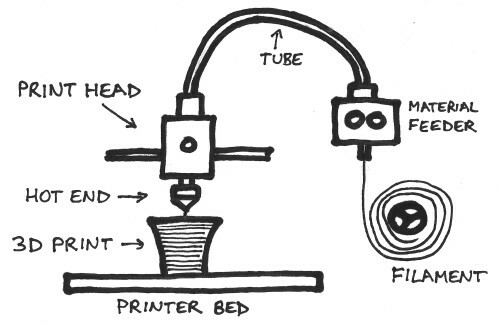 THE PRINT HEAD IS ATTACHED TO TWO RODS THAT MOVE THE HEAD ACCORDING TO THE CODE THAT IS FED INTO THE PRINTER. AFTER FINISHING ONE LAYER, THE PRINTER BED MOVES DOWN A BIT. THE NEXT LAYER IS THEN PRINTED ON TOP OF THE PREVIOUS LAYER. HOW DOES IT KNOW WHAT TO PRINT ? TO PRINT SOMETHING YOU NEED A 3D MODEL. OF AN OBJECT BY DIVIDING IT INTO MANY LITTLE TRIANGLES. THIS 3D MODEL CAN BE DESIGNED USING ANY KIND OF 3D DESIGN SOFTWARE. THE 3D MODEL IS FED INTO THE PRINTER SOFTWARE, CALLED THE "SLICER". "SLICING" THE MODEL INTO MANY HORIZONTAL SLICES. PRINTS THE MODEL - LAYER BY LAYER. WHAT'S THE MATERIAL IT IS USING ? ALTHOUGH OTHER MATERIALS ARE AVAILABLE, WE PREFER TO USE PLA. IT IS 100 % RECYCLABLE AND 100 % BIO-DEGRADABLE. SO NO "PLASTIC SOUP" DUE TO OUR SHOP !